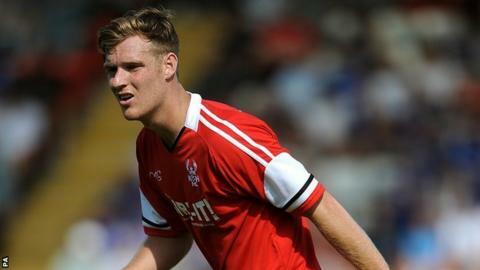 Wrexham have signed Kidderminster Harriers midfielder Kyle Storer on a deal until the end of the season. The 27-year-old former Harriers skipper has left Aggborough by mutual consent to be reunited with Wrexham boss Kevin Wilkin, his former manager at Nuneaton. Storer, who hit 13 goals in over 150 Harriers games, may make his Wrexham debut at home to Torquay this Saturday, subject to international clearance. "The ambition of the club has forced my hand to come and join," said Storer. Kyle Storer scored 13 goals in 127 (6) Conference appearances after being signed by Steve Burr from Nuneaton Town in July 2011. He was Burr's captain when the Harriers finished second in 2013, losing to Wrexham over two legs in the play-off semi-finals. "I'm just glad to get the chance to come and play here at such a professional club. Hopefully we can kick on and be around the play-offs at the end of the season." Wilkin's Wrexham are 17th in the Conference, 10 points above the relegation zone and 12 points behind fifth-placed Harriers, who currently occupy the last of the four play-off places. But Harriers have budgetary restraints, having already had to let several players go this season, defender Chey Dunkley (Oxford United), and strikers Nathan Blissett (Bristol Rovers), Michael Gash (Barnet) and Freddie Ladapo. Storer's release by Harriers was triggered by a clause in his contract, signed in 2012, a statement on the Harriers website explaining that "a reduced budget going forward would make this clause unrealistic".